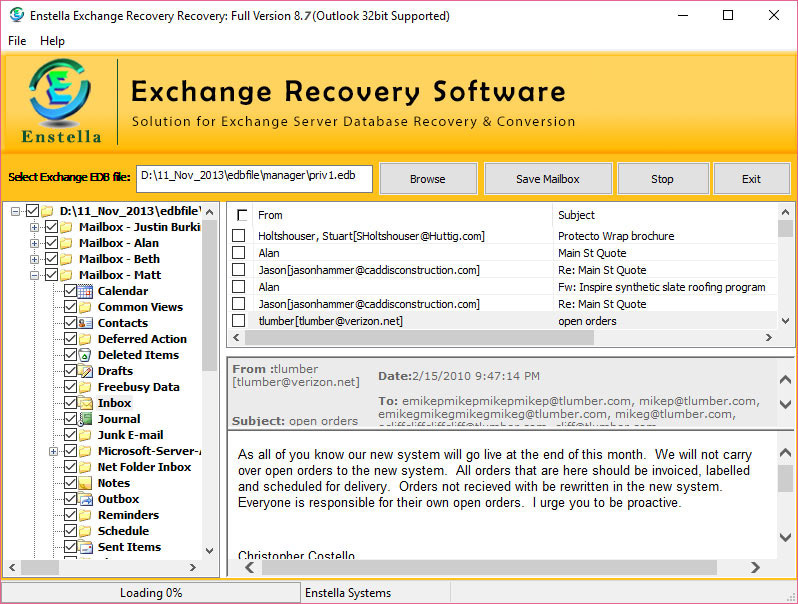 Are you got frustrated with the continuous non-recovery of corrupted EDB file and do not know that How to convert EDB file to PST then let go through with Enstella Superb Convert Exchange files PST software which instantly repair exchange mailbox database to convert exchange email to pst securely. Enstella Convert EDB program does fast and safe operation to convert EDB file to PST. Enstella EDB Convert tool is bundled with lots of unique and relevant features, which works smartly to convert EDB file to MS Outlook database: * Enstella Extract EDB Tool is very performable and sensible tool to convert exchange file to PST * Sleekly makes the process fast in converting Exchange file to PST * Enstella Convert EDB to PST smoothly recover EDB database from various version of MS Exchange server 5.0, 5.5, 2000, 2003, 2007 * Enstella EDB to PST Conversion program allows you to transfer EDB database within Microsoft Outlook like 98, 2000, 2003 and 2007. * Conversion of EDB to PST software is very much easy and simple to install and uninstall. * Legible Graphical User Interface. Put your wish towards Demo version of Enstella Predominant Convert EDB file to PST software to recover EDB or repair EDB or Convert EDB database to outlook. Further, after using demo version you can purchase full version of Enstella EDB Convert PST program only at USD 299.